This week’s cupcake idea is brought to you by Dylan! 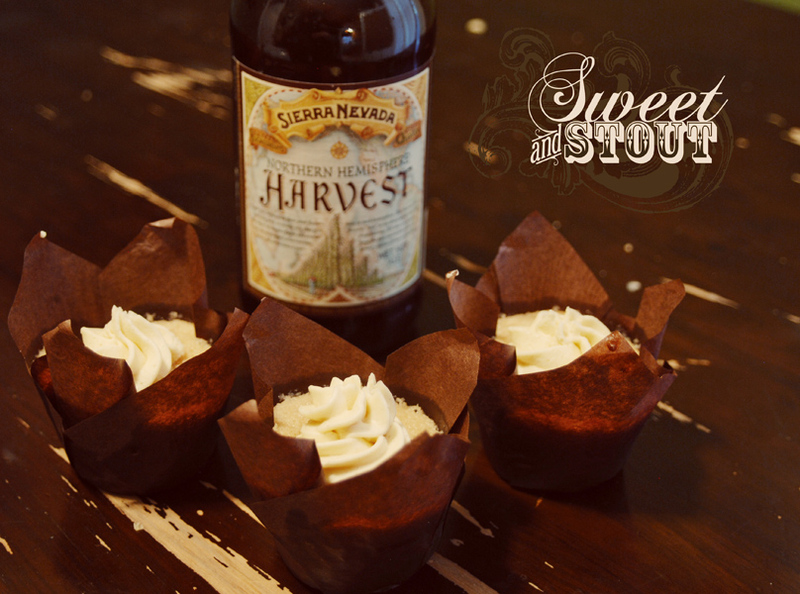 We used Sierra Nevada’s Northern Hemisphere Harvest Ale in these apple pie inspired cakes. The Harvest Ale is wet hopped with hops from Yakima Valley and give this beer a fresh, crisp taste. Definitely a great pairing with the granny smith apples that went into this cake. While Dylan created the batter, I caramelized the apples on the stove top. 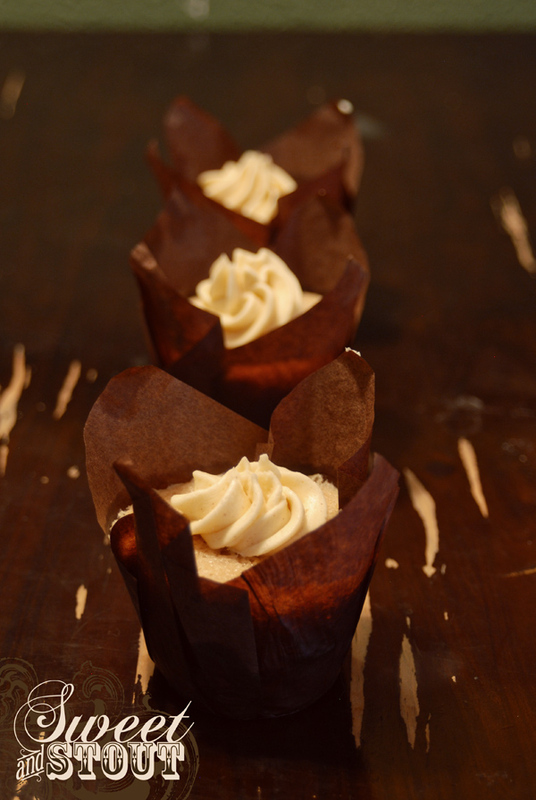 We used some of these brown paper cupcake wrappers, a gift from my sister, Taylor, for Christmas. They were just the right height to fit in our toaster oven, and look really pretty. After the batter was placed in the wrapper, I topped each off with a few apple slices and sent them to be baked. The frosting on these was interesting. It came out really thick, I equated it to working with concrete. It was almost too thick to come out of the frosting gun. You can see by the pictures that the frosting looks pretty stiff. It tasted really good though, so we did our best to work with it. I think if we were to bake these again, we’d put a lot more apple on the top. The cake turned out really soft and spongy, very enjoyable. 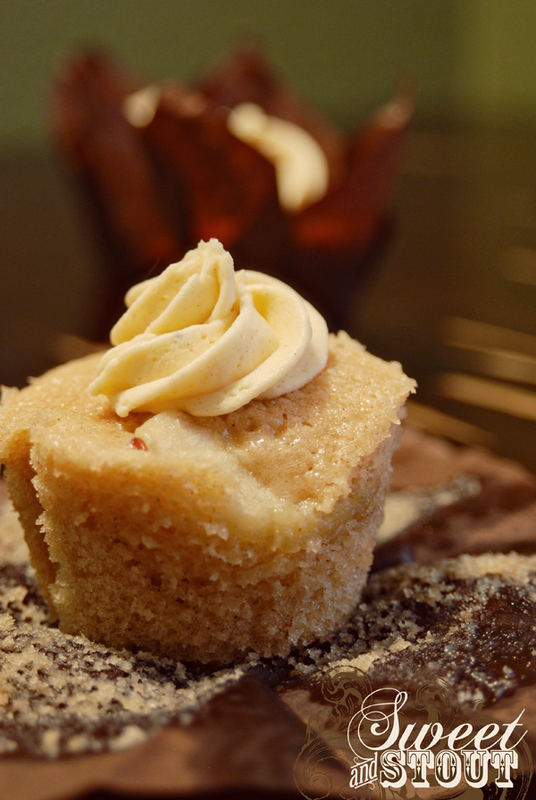 Oh, and maybe a brown sugar crisp topping would be a tasty addition, or a substitute for the heavy frosting. They do taste really great just the way they are. In other news, this Friday you can catch Sweet and Stout at the grand opening/ First Friday event over at Studio 66 Art Gallery, here in Spokane. You can see the invite here for time and location, or check them out on facebook. If you’re in the area, you should definitely stop by and see us, plus see some amazing art from local artists! 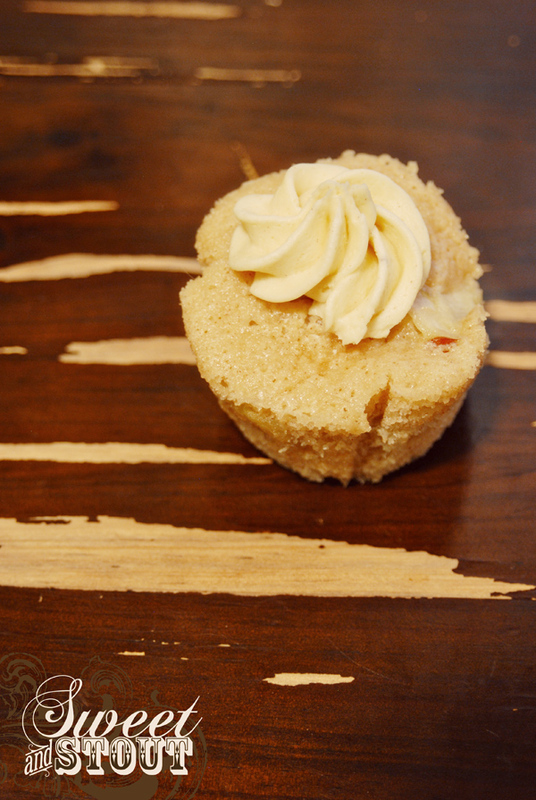 We’ll have mini cupcakes on hand for ease of snacking while viewing some great art work! The event starts at 5, and we hope to see you there. 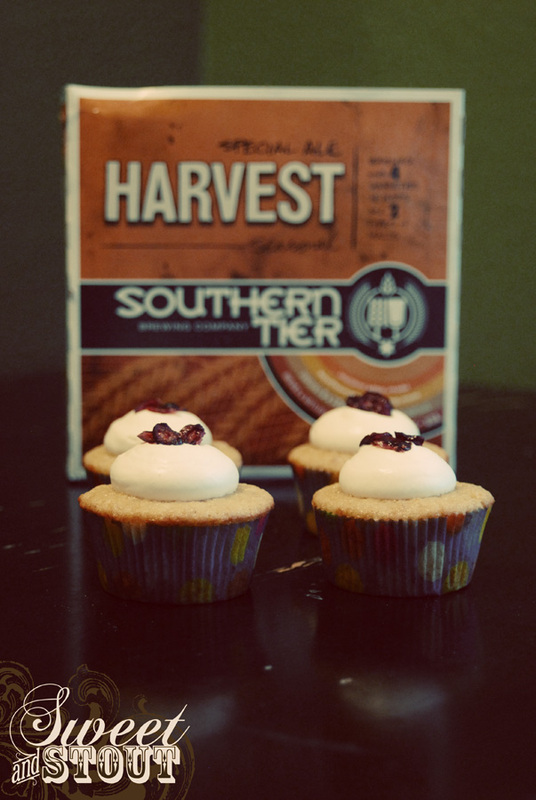 In the spirit of fall (the best season), we present to you, these cranberry orange cupcakes made with Southern Tier Brewing’s Harvest Ale. We have been looking forward to trying this beer, and have yet to be disappointed by Southern Tier. This beer is perfect for fall! It was also perfect for our recipe this weekend. One of my favorite (besides pumpkin) flavors of fall is cranberry. It’s tart but sweet flavor, is great in desserts, and complimentary to a turkey dinner for thanksgiving. 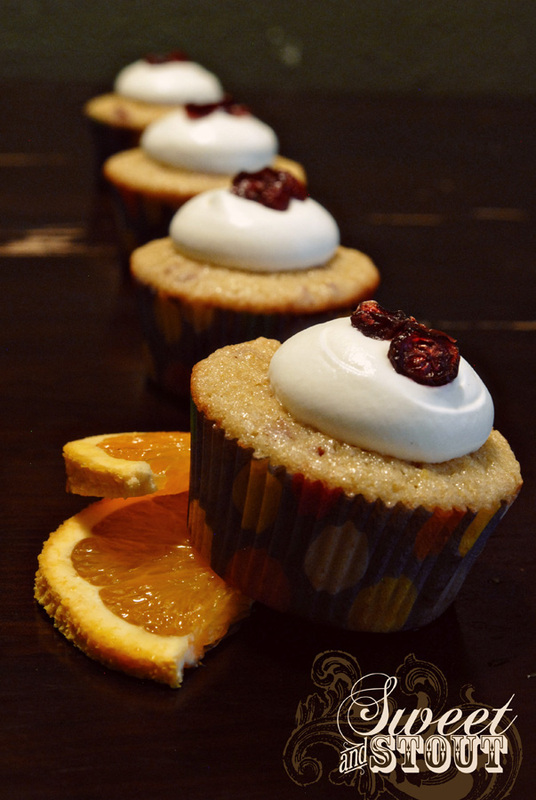 Orange is great paired up with cranberry, so we used our orange cake recipe (with a few modifications) to make this tasty treat. The night before we baked these, I took some dried cranberries and minced them, then placed them in some orange juice to soak over night. When I pulled them out of the refrigerator, they had absorbed a lot of the orange flavor nicely, and I added them into the batter. 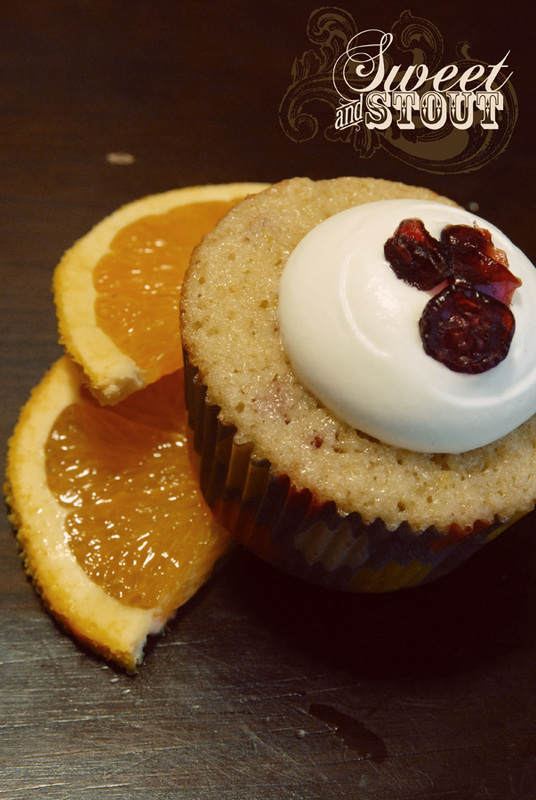 I also included some of the cranberry flavored orange juice to help carry through the flavor in the cake. For the frosting, we did a light whipped cream and garnished with a few cranberries for extra flavor. These turned out exactly how I wanted them to taste. A creamy orange cranberry cake. 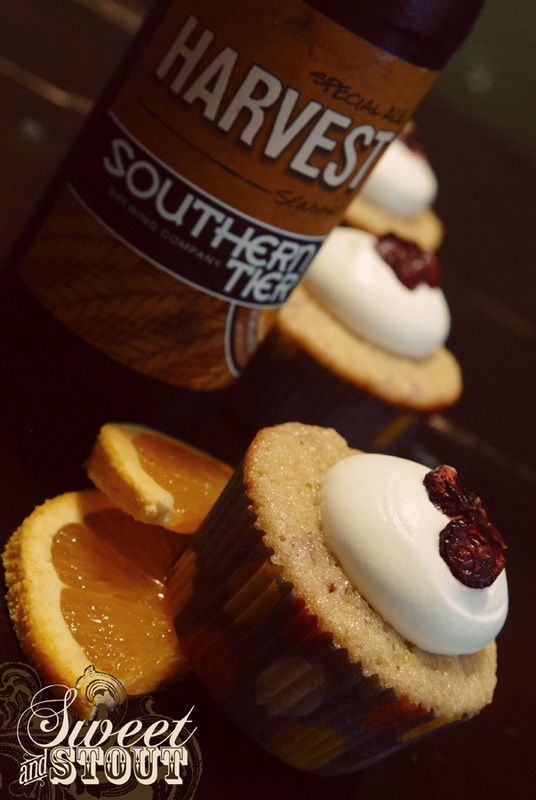 The bite that you get from the Harvest Ale, partnered with the cranberries, really gives these cupcakes some personality. They would definitely make a great addition to a holiday meal this fall. I’m tempted to keep the leftovers here at home, rather than take the extras into work!